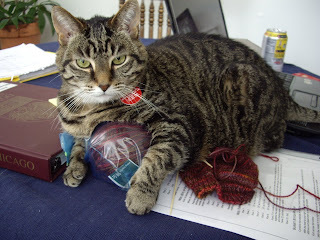 Kylie was not a fan of me working on Sockapalooza socks rather than petting her, as evidenced below. Note that once again she has picked a way to sit that boggles the human mind -- how on earth can that be comfortable? I learned a valuable lesson while working on these socks -- to trust my judgment. 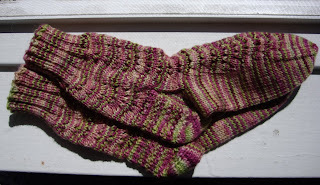 I knit a whole sock that I was afraid would be too big. Guess what? It's way too big. My sock pal has bigger feet than I do, but she would have to have the feet the size of Hagrid's for these to fit. 72 stitches on size 1 dpns = enormous! So it was back to the drawing board for me. 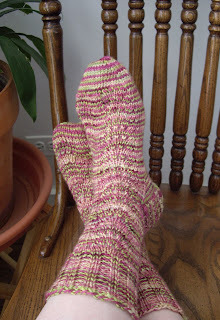 These are Little Shell Socks knit with Sundara sock yarn in the "Dahlia" semisolid colorway. 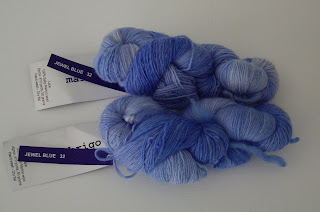 The yarn is gorgeous, and it will be very hard to part with these beauties. These may be a bit on the small side, but socks always seem to stretch out over time. I'm absolutely thrilled to be done teaching for the summer. There's just a little bit of grading left. The good ol' Malibu broke down on Saturday, amidst a smelly cloud of fumes and a fountain of coolant spraying from my radiator hose, but the timing was perfect. I was 20 feet from my apt. and a great parking space, and now that summer session is over I have the time (and the $) to deal with repairs. 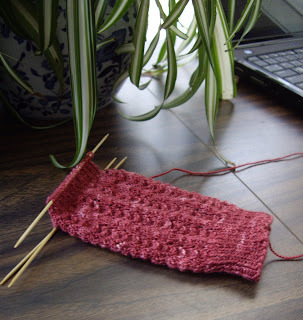 I have been absolutely swamped with work lately, hence the lack of knitting and blogging. Things are about to change, though -- just two more days of teaching summer school! What's making me happy these days? 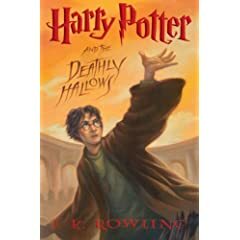 - I decided not to clean the bathroom, vacuum my apt (despite the terrifying cat hair tumbleweeds dancing nimbly across my hardwood floors), or go grocery shopping last weekend in order to finish the new Harry Potter! No spoilers here. I enjoyed the book, although I thought the pacing/timing was a bit off. One of my favorite parts -- there were even more spells in Latin than usual. - The gorgeous owl necklace that I ordered from Julie's Etsy shop, South Street Designs, arrived today, and I LURVE it. The faux coin reminds me of Athenian drachmas, which were often referred to as owls. The owl is the goddess Athena's animal, you see, and thus an emblem for the city-state, too. Yes, I'm a big nerd. - A new Whole Foods opened up just 4 blocks from my apt. today! Fresh veggies, fancy cheese, meats that actually look appealing. When I lived in Madison, WI, I was very spoiled by living a very short (and picturesque) walk from Whole Foods, so having to actually drive to the one here in Lakeview and navigate the awful and dangerous parking lot was quite the disappointment. I've already paid a visit, and I am quite pleased. The Waterloose socks are complete! I must admit that an Abba tune kept running through my head as I worked on these. Notes: Great, easy sock pattern! I might do something different with the toes next time. 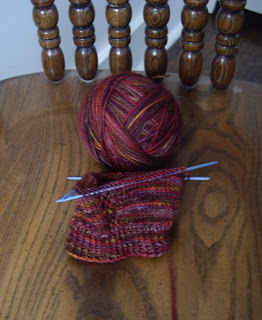 I went down to size 3 needles for my narrow feet, although 4s would have been fine for the cuffs. Jennifer over at Craftlily sent me some lovely yarn as a runner-up prize for the most thematic parcel in the Knitflix Swap. Many thanks, Jennifer! 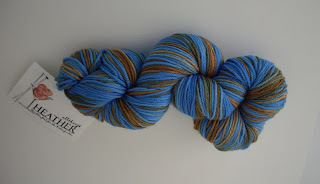 It's All Things Heather sportweight sock yarn in a great colorway - "Cowboy." Due to the dearth of Malabrigo laceweight in Chicagoland, Mia most thoughtfully volunteered to act as my personal shopper. It's so soft, and the colors are gorgeous! It's "Jewel Blue." Last Wednesday I went to the Lincoln Park PaperSource for a Girls' Night Out papercrafting event, and it was unbelievably fun. We tried out new papers and tools, make a necklace, some coasters, and a CD accordian holder. There were yummy cocktails and treats, and everyone was very friendly. I'll have to post some of my goodies and projects. I highly recommend this event! Oh yes, it's a Harlequin Nascar romance. Both terrifying and bizarre! This is how far I am on my sockapalooza socks. Not good. I need to kick the knitting into high gear. The Fleece Artist merino sock yarn is a joy to knit, and the colors are perfect for my pal. Sonya sent me a lovely Colorswap package. 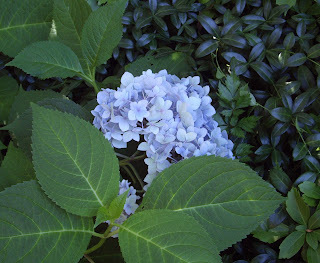 Blue was the theme for June -- how could I resist? 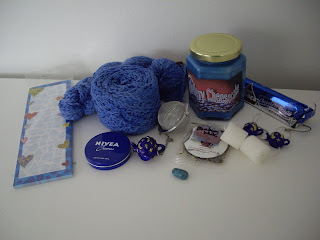 There are tons of lovely goodies in here, including some gorgeous Manos Cotton Stria, a yarn that I have been wanting to try for quite a while. Her son even included one of his favorite blue rocks from his rock collection. Isn't that sweet? 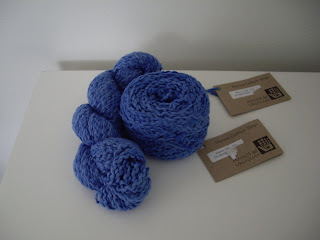 Gloriana over at A Mingled Yarn knit the cutest baby kimono with this yarn, and I'm going to follow in her footsteps!